Two recent renovation projects by the Faculty of Arts and Sciences, Extavour Laboratory and the Science Center - Cabot Library Project, mark the next phase in Harvard’s commitment to green buildings with their recent achievement of the first and second LEED v4 Commercial Interiors certifications in Massachusetts and on campus. Both projects sought to modernize and enhance the learning and research experience for students and faculty while featuring progressive sustainable design strategies which help to reduce energy and water use without additional cost. For nearly two decades, the University’s facilities and project planning teams have aggressively pursued and implemented high performance, green building strategies and practices driven by the Harvard Green Building Standards and ambitious climate action goals. Harvard continues to serve as a model for how organizations can adapt and evolve to address the changing landscape of sustainable practices with the focus on health and wellbeing. These certifications serve as great case studies on what is achievable when there are proactive environmental and green building goals in place. -Jaime van Mourik, Vice President of Education Solutions, USGBC. In October 2014, Harvard’s Green Building Standards were updated to include LEED v4, requiring all Tier 1 capital projects (all new buildings and full building renovations) to achieve LEED v4 Gold as a minimum, a full two years before the USGBC made LEED v4 a mandatory requirement. The Extavour Laboratory (registered in September 2015) and Science Center - Cabot Library (registered in February 2016) projects both voluntarily opted to pursue the more stringent LEED v4 rating, even though they were Tier 2 projects, making their certifications that much more impressive. LEED v4 is a more rigorous standard than its LEED 2009 predecessor, incorporating improvements in the areas of health, energy reduction, material life-cycle, and water efficiency. The goals of LEED v4 are organized into seven “impact categories.” These categories are: reverse contribution to global climate change; enhance individual human health and wellbeing; protect and restore water resources; protect, enhance, and restore biodiversity and ecosystem services; promote sustainable and regenerative material resources cycles; building a greener economy; enhance social equality, environment justice, and community quality of life. LEED v4’s expanded focus on a building’s full life-cycle pushes building teams to consider not just design and construction, but also on-going maintenance and operation of the building. Building managers are encouraged to track reductions and continuously monitor and measure in the areas of energy, water, materials, waste, and health and human experience. LEED v4’s expanded focus on a building’s full life-cycle pushes building teams to consider not just design and construction, but also on-going maintenance and operation of the building. LEED v4’s focus on materials requires a deeper and transparent look at what we are using to construct our buildings and the health, environmental, and social impacts associated with those materials. Environmental Product Declaration (EPD) is a disclosure framework highlighting a product’s environmental life-cycle impacts. Extavour Laboratory achieved this credit in an attempt to reduce its material selections’ impact on the environment. Corporate Sustainability Report (CSR) is a disclosure framework highlighting a company’s commitments to long-term ecologically responsible land use as well as reducing environmental harms from manufacturing and extraction. Cabot Library achieved this credit in an attempt to reduce its material selections’ impact on the environment. According to the USGBC, these materials credits are difficult to achieve on most projects. As part of Harvard’s Green Building Standards, vendors are required to disclose the materials and chemicals used in the manufacturing of their building products. The documents collected as part of this process helped inform the changes made to the Harvard Green Building Standard in 2017. The 2017 version of the Harvard Green Building Standards, updated in December, goes beyond transparency, and optimizes for health by specifically addressing and eliminating chosen classes of chemicals in select building products. 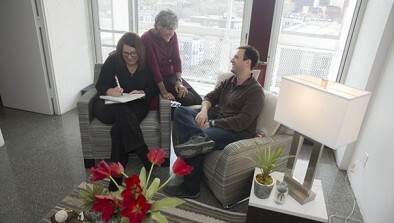 For many years, FAS has been committed to reducing energy use and emissions in our buildings. We are constantly pursuing improvement through new equipment, materials, and modes of operating that make the facilities more efficient, greener and healthier. The Science Center - Cabot Library project, completed in April 2017 and certified in December 2017, included the renovation of the main entryway of the building, common area, Library, café space, arcade and courtyard in the Science Center. This project was made possible by a generous gift from Bryan Traubert and Penny Pritzker ’81, as part of the Campaign for Arts and Sciences. Project teams were committed to modernizing, connecting, and enlivening the space, with a primary goal of creating an open, inviting space for students. The first and lower levels of the Library encompass the LEED certified space and include a café area and coffee bar occupied by the vegetarian vendor Clover, multi-purpose rooms, media rooms, and study areas. The renovation included all new mechanical, lighting, power, and plumbing upgrades. 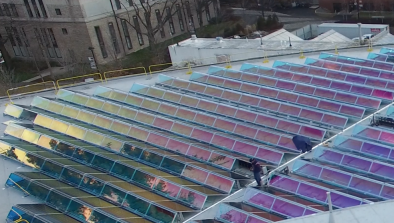 Given the Science Center’s central location to campus and hub for classes, lectures, and study, it is occupied for extended periods throughout the year, making energy saving strategies critical. Installed throughout the space are healthier, high-performing LEDs, ceiling-mounted occupancy sensors able to manage lighting setbacks, and lighting controls with adjustable levels. The project team implemented a Siemens network lighting system, the first on campus, designed to reduce lighting power 49% below code and improve the indoor environmental quality for occupants by maximizing the flexibility, comfort, and aesthetics. Additionally, having one manufacturer of the building management system and lighting control systems enables ease of communication and maximizes the benefits. Other energy conservation measures include a new air-handling unit with high efficiency fans and motors, occupancy sensors, and temperature sensors; and low-flow water fixtures installed throughout the project space are expected to reduce water use by 38%. Extavour Laboratory, housed in the Department of Organismic and Evolutionary Biology and the Department of Molecular and Cellular Biology, focuses primarily on the evolution and development of reproductive systems in animals. 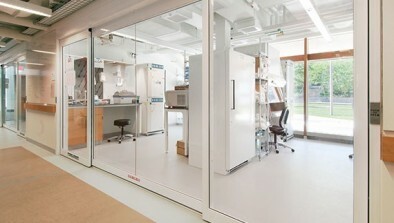 The laboratory renovation in the BioLabs Building included new lab space, office areas, a communal room, interconnected research rooms with a temperature-controlled microscopy room, and an arthropod facility for USDA regulated research. In pursuing LEED v4, Extavour Laboratory was required to install an automatic receptacle control due to the space types within the project. Automatic receptacle controls turn off plug loads when spaces are not occupied, requiring occupant engagement and responsibility. As plug load energy use increases in our buildings, in part due to energy-intensive equipment and more electronics, project teams are increasingly encouraged to consider energy conservation measures targeted at this load to mitigate consumption. Extavour Laboratory’s implementation of this strategy serves as a model for building and facilities managers across the University to pursue this strategy and to engage occupants in conversations about sustainability and encourage behavior change. Other energy conservation measures include occupancy sensors installed in the renovated spaces that save energy by safely setting back the ventilation rates and turning off the lights when occupants are not present in the lab. Additionally, 95% of the equipment purchased for the project is ENERGY STAR certified, and low-flow fixtures help to reduce water use by 38%. @GreenHarvard about 6 days 9 hours — @HarvardMuseums @HarCommonSpaces Go, @HarvardMuseums! Striving for a plastic-free future! !